The final accounting has yet to be done, but from the figures available now, it appears March will be another record month for new car sales. Kelley Blue Book (KBB) reports that preliminary data suggests sales surged 8% this month, at a seasonally adjusted annual rate of 17.2 million vehicles. KBB says sales were helped by still-low interest rates and two extra selling days. “The industry continues to maintain its momentum in March as we expect the highest volume of any month in more than 10 years,” Tim Fleming, analyst for Kelley Blue Book, said in a statement. That said, the multi-month trend of ever-increasing car sales might be running out of steam. Fleming says there are indicators suggesting that demand for new cars is weakening. Carmakers had to offer more incentives, and boost fleet sales, to keep the sales totals moving higher. The projected 8% rise over March 2015 might be eclipsed by comparisons to last month. KBB said it projects March new vehicle sales rose 24% from February. It could turn out to be the highest March sales total since 2000, and the strongest month since July 2005, when the U.S. was roaring along, propelled by the housing bubble. KBB projects Fiat Chrysler will win the month, posting double-digit growth in March. Its biggest improvement likely came on exceptionally strong sales of Dodge Grand Caravan and Chrysler Town & Country minivans. The Jeep brand also provided a boost, posting strong year-over-year strength, thanks in part to the Renegade. Honda also had a good March. KBB says strong sales of the new Civic likely will give the carmaker a double-digit growth rate for the month. The Honda Pilot was one of the fastest-selling models in March, averaging just 18 days on dealer lots. KBB projects that three automakers – Volkswagen, General Motors, and Toyota – lost ground in March. Its estimate projects VW sales dipped the most, declining 0.6% as it continues to deal with the fallout from the diesel emissions cheating scandal. 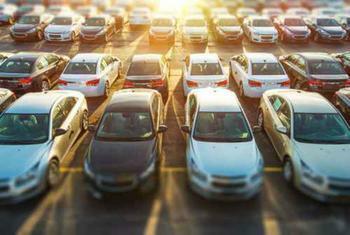 Low gasoline prices may be driving new car sales. Lower prices at the pump certainly seem to be influencing consumers' purchase decisions, as KBB notes continued strong sales in March for trucks and SUVs.